Social impact bonds have not yet delivered upon their promise, social investment is too expensive for many organisations and lots of smaller organisations lack the skills and capacity to take on loans. These are some of the criticisms of the current state of the social investment market raised by the House of Lords select committee on charities. The committee published a report, Stronger Charities for a Stronger Society, on 26 March. The report followed several months of investigation by the peers into the challenges faced by charities (including those that consider themselves social enterprises) in England in Wales. The committee made 100 conclusions and recommendations encompassing the possible impact of Brexit, the use of contracts, charities’ role as advocates for their beneficiaries and more. One chapter in the report focuses upon social investment as it “has been heavily promoted by government as a new form of income for charities”. The report defines social investments as including loans, equity, “quasi equity” (where the lender takes their returns as a proportion of the organisation’s future revenue), overdraft facilities and social impact bonds. The peers took evidence from a range of experts in social investment as well as Rob Wilson, the minister for civil society. However, the peers note that alongside the potential advantages, there are also barriers. Smaller charities told the peers that social investment was too high risk, interest rates were prohibitively high and loans were usually too large for their needs. In some cases charitable organisations had taken on unsustainable levels of debt. The report quotes committee witnesses who said that charities found the social investment market “opaque and confusing” and that many of them didn’t have the skills and capacity to consider social investment. Additionally, there is a tension with some private investors expecting at least the same level of financial return as they would receive in the private sector. The report welcomes measures that have been taken to make social investment more accessible to smaller organisations, such as the launch of the government-backed Access Foundation, which aims to broaden the accessibility of social investment to small and medium sized charities. The peers said that the government must “provide additional resources to support charities to ensure that they are not left behind as the market expands”. The peers focused in particular on the pros and cons of social impact bonds. Social impact bonds are outcomes-based contracts between public and private sector bodies. The public body agrees to pay for interventions on the basis that improvements in social outcomes will be delivered. The private provider pays for the intervention upfront, and is repaid by the public body on condition that significant social impact is achieved. Often, private providers will contract charities to carry out the intervention while retaining the financial risk. The report says that the peers heard evidence “that the advantages and potential of SIBs may be more limited than the government has suggested”. The peers conclude: “The expectations placed upon social impact bonds have yet to materialise and we believe the government’s focus on them has been disproportionate to their potential impact. The committee is awaiting a response from the government to the report. 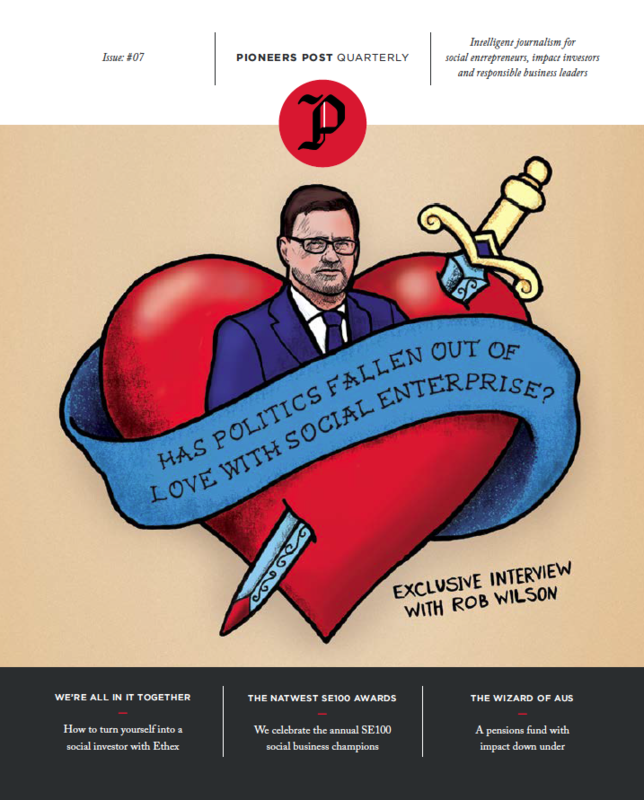 "I do believe social investment is a major opportunity": read our interview with civil society minister Rob Wilson in the latest issue of Pioneers Post Quarterly. Big Lottery Fund, Big Society Capital and the Cabinet Office have teamed up to launch Access: The Foundation for Social Investment to provide £100m of support to assist social ventures struggling to access finance. There are many other types of social investment that are simpler, cheaper and growing in popularity, social investment experts tell a House of Lords committee. Social impact bonds: speed up or slow down? SIBs are rapidly gathering momentum around the world. In the red corner, Dan Gregory says its time to slow down and in the blue corner Joanne Hay says the time is right.